For years, there was no need for a stop in Prescott, but the Team Ontario bus was thankful to round up the eight Ottawa South United Force players en route to Montreal’s south shore for this season’s provincial teams competition against Quebec. A number of local players selected for the Quebec vs Ontario matches made a big impact as Ontario swept the three-game series at each level from U14 through U16 in boys’ and girls’ action on the April 24-26 and May 1-3 weekends. After a tie in their first game, Assaf launched Ontario to a 3-2 win with a pair of goals in their second match and cruised to a 4-1 victory in the third encounter. In the girls’ U14 competition, OSU’s Ariel Young and Olivia Cooke also found their way onto the scoresheet. Mollie Eriksson enjoyed having a number of OSU teammates at her side for the event. 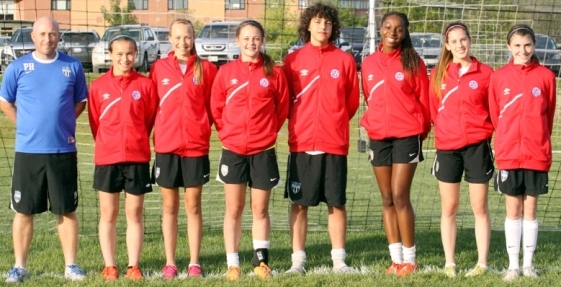 The 2000-born goalkeeper had previously been part of regional, provincial and national programs, but she was the only Ottawa participant on most occasions. U16 girls’ striker Clarissa Larissey, last year’s OYSL scoring champion, savoured the intensity of the matches between the provincial rivals. Getting the best chance to strive for bigger objectives was a main attraction for Youma Konate to join OSU two years ago, even if it can take the Grade 9 Colonel By Secondary School student 45 minutes to get to the field sometimes. The prospect of playing for Team Ontario acted as a strong motivator, says Emily Amano. The pre-season experience with Team Ontario has translated into a quick start for OSU’s nine teams in provincial league play, having recorded just one single loss across all age groups through three weekends of play. With OSU players having earned an equal number of provincial team positions last season, Club Head Coach Paul Harris says that the repeat representation provides a big reason for the club to celebrate. “The fact that it’s consistent and becoming habitual, I think Ottawa has been put on the map,” Harris underlines. “It’s a great progression. It’s a testament to the club and all the coaches for all the hard work that’s put in behind the scenes. Now we’re not just getting one or two into the Ontario team, we’re getting seven or eight every year.